As in prior years, I imagined that December and January would be quiet months for me. However, it’s been anything but that the last few weeks due to two unexpected occurrences. First, I’m a Federal employee directly impacted by the government shutdown. 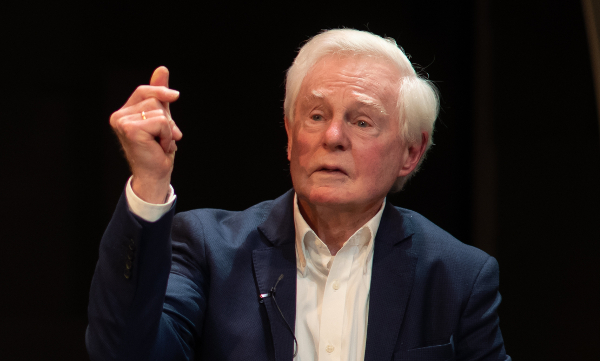 The second and decidedly far better circumstance was that shortly after New Year’s Day, I boarded a plane to London for a very exciting assignment: an interview with Sir Derek Jacobi. Jacobi’s acting career is full of iconic roles such as Claudius in I Claudius, Hamlet, Alan Turing in Breaking the Code, Cyrano de Bergerac and many more. He details a lot of great stories around these moments in his 2014 memoir, As Luck Would Have It. These days, U.K. fans can catch him as Bishop Myriel in the Les Misérables TV series on the BBC. While waiting for the April premiere of Les Mis on PBS’ Masterpiece, Americans can join their U.K. counterparts in hearing the 80-year-old actor bring to life the voice of Odin in Neil Gaiman’s Norse Mythology and his superb reading of A Maigret Christmas on BBC Radio 4. The Good Omens television serial, another Neil Gaiman project, hits Amazon Prime by mid-year 2019 with Jacobi as Metatron. 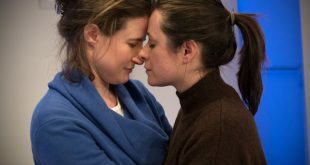 All that information was still whirling in my mind on January 6 as I arrived at Chickenshed Theatre, an inclusive company in North London that presents vibrant productions, classes, and singing workshops for adults and children. 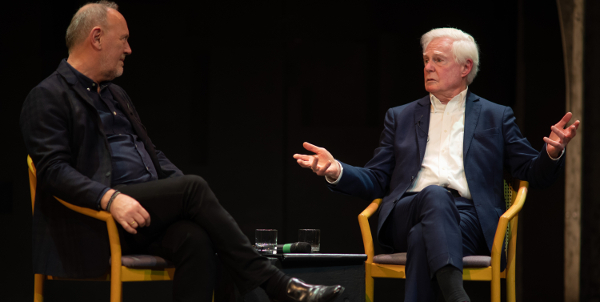 That evening, Chickenshed was holding a special event, An Evening with Sir Derek Jacobi, in which the celebrated actor would discuss his life and career. Within minutes of stepping through the doors, I was whisked past the bustle, down a hallway, and over the threshold of a dressing room. I immediately recognized Richard Clifford, Jacobi’s partner, standing confidently at the end of the room. He was attired in a dark blue shirt and dark suit. He greeted me with such a friendly disposition that I was instantly won over. I realized that he must also be the evening’s moderator. Halfway into the room stood Jacobi clad in a sharp navy blue suit and with his back to me. A theatre associate was completing one last microphone adjustment. The veteran actor was looking over his shoulder at me as I approached and he stretched out a hand to grasp mine warmly. Free of technical considerations a moment later, Jacobi kindly offered me a chair opposite his so that we could commence. I was pleased to find Clifford taking a seat to my right for the interview as well. Of the four Hamlets that you’ve done, five including Frasier, which do you look back on most? Jacobi: I think Frasier. (Laughs with me) Oh, gosh, I think probably the one that took me to Elsinore. I play it in the very castle where it’s set. That was the most thrilling. Why did you select history as your major at Cambridge? Jacobi: Because I had a very good memory, I mean not completely photographic, but very instant. I really went to Cambridge because I knew that it was a hotbed of acting. And I had to choose something academic in order to get there. History for me was very easy because it was easy to learn facts, regurgitate facts, and create endless theories about why that happened in history, which we do with history. Nobody can gainsay you. It was an easy way to be at Cambridge and act. I was actually an art history major. Radio seems to be a lot bigger here in the U.K. than in America. In terms of audiobooks and radio dramas, is the prep work a lot more extensive? Jacobi: No, no. Well, I don’t find so. Perhaps I’m a bit of a cheat, but I’m very good at sight-reading. I can – of course, I do my homework on a book that I’m going to do. But I’ve just done a thousand pages of [Charles] Dickens’ Martin Chuzzlewit. Now I couldn’t wend my way through that. It took me 12 days to record it. Over the years, you develop sight-reading skills so that you can start a sentence and not knowing how that sentence is going to end, but then during your speaking of it, you can look ahead and see that “Oh, there’s a question mark at the end!” You can change your tone mid-sentence so that it sounds as if you knew what the end of the sentence was going to be. But there are tricks. There are tricks which I’m quite good at though. Clifford: A Jeffrey Archer book. Jacobi: A Jeffrey Archer book, which was so boring I didn’t read it. I got two thirds of the way through and discovered that one of the characters was American. So we had to go back and do all her dialogue, redo it with an American accent. But fortunately, the producer also found the book a dead bore. He also hadn’t finished it. Are you going to do any more documentaries? Jacobi: Documentaries? (raises his brows) Why, I don’t know! I haven’t done that many. I did one on [David] Garrick. Garrick. (I nod) You did one on Dickens. Jacobi: Dickens, yeah. They’re fun actually, documentaries. Yeah, they are. Clifford: And part of the Shakespeare authorship question. Is there a character you’ve played who is most like you? Jacobi: I think probably Prince Myshkin in The Idiot. A saintly fool. You’ve seen a lot of the work that each of you has done over the years. Do you have a “Top Three” of each other’s work? Clifford: Yes, I do. I have and I think Derek’s is Much Ado [About Nothing], which was a joy. I think Cyrano, which was one of the pinnacles for me of his career. And King Lear, which was also magnificent. Jacobi: For Richard, I think his direction of She Stoops to Conquer! Clifford: Which I did in Washington, D.C.
Clifford: Which I did last year at the Folger. And Boyet, Love’s Labours’ [Lost]. Jacobi: And Boyet. Oh, yes! (turns back to me) Four! Awesome! Well, that’s our time for now. Thank you. *Interviewer’s Notes: Sir Derek Jacobi participated in two additional documentaries that I highly recommend. Discovering Hamlet focuses on his directorial debut of a critically acclaimed 1988 stage production starring Kenneth Branagh as Hamlet. The other excellent documentary is Who Do You Think You Are? following Jacobi’s research into his family tree with various experts. Richard Clifford appears briefly in both programs.